Offer valid from December 1st, 2018 to December 31st, 2018. 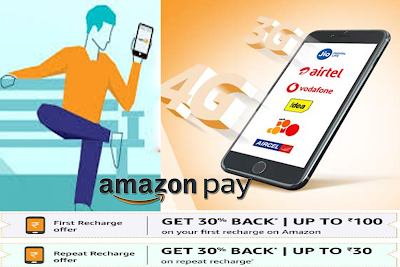 Cashback will be credited to Amazon Pay balance within 3 working days of the Recharge. First recharge offer can be availed only on FIRST EVER mobile recharge transaction by the customer on Amazon.in- maximum cashback of INR 100. Repeat recharge offer can be availed any number of times.